NPR: The Obama administration plans to reverse a Bush-era policy and make millions of undeveloped acres of land once again eligible for federal wilderness protection, Interior Secretary Ken Salazar said Thursday. The agency will replace the 2003 policy adopted under former Interior Secretary Gale Norton, Salazar said. That policy — derided by some as the “No More Wilderness” policy — stated that new areas could not be recommended for wilderness protection by the U.S. Bureau of Land Management and opened millions of acres in the Rocky Mountain region to potential commercial development. Environmental activists have been pushing for the Obama administration to restore protections for potential wilderness areas. Wall Street Journal: As the economy gradually recovers, some big U.S. companies are cranking up their recruiting and advertising thousands of job openings, ranging from retail clerks and nurses to bank tellers and experts in cloud computing. Many of the new jobs are in retailing, accounting, consulting, health care, telecommunications and defense-related industries, according to data collected for The Wall Street Journal by Indeed Inc., which runs one the largest employment websites. 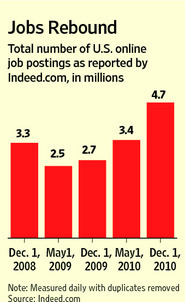 It said the number of U.S. job postings on the Internet rose to 4.7 million on Dec. 1, up from 2.7 million a year earlier.